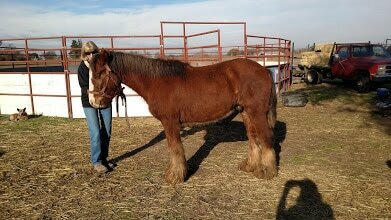 Rescue: Gypsy Magic assists Gypsy and/or Gypsy cross horses in need of rescue. Some of these horses may be surrendered, abandoned, neglected or abused, found at auction or sales. We strive to help these horses become healthy, happy and useful purposes and find forever homes. We network with other rescue groups to help assist with regional placements. Consideration for accepted horses are on a case by case basis to ensure we are able to provide the very best situation and potential placement for each horse. Rehabilitation: Our volunteer rehabilitation program is designed to rescue and rehabilitate pre-approved Gypsy and Gypsy cross horses. With our equine specialist professionals, participants in the project are an integral part of the rehabilitation process. Volunteers experience a wonderful and rewarding journey of rehabilitation. The horses thrive under the health care, social interaction, and training they receive in this program. Re-home: The re-home project is the final stage to ensure the program horses are placed in the very best situation they are most suited for. Horses may be adopted and incorporated into our own therapy program or another therapy program for those in need. The horse's may qualify for adoption by qualified owner's. Blazen and his full sister Silvie were brought to Stacy's attention by a "friend of a friend" phone call in 2016. They were two young Gypsy horses that were being offered for sale and were said to be in need of a good home. When we went to see the two horses, it was clear they needed placement immediately with someone who could give them the health care, handling, and training to become healthy and mentally happy horses. We purchased both horses the next day and transported them to their new "home of hope". Both horses were quite feral and would not allow people to come anywhere near them for several weeks. Our contact process was slow. They did not know what treats were, or even what grain feed was so we started to offer them enticing blades of green grass through the fence. This small gesture slowly lead to them understanding they did not have to run away or fear the sight of humans. They were very bonded to each other so we did not dare try to separate them. Through a long and patient process we gently worked with them together. They learned to not fear us or a halter and lead rope within their enclosure. We started to introduce them to small new things each day and their trust grew until we could finally start leading them on walk-abouts outside their enclosure and start some simple ground work in the arena. Our volunteer team at Vineyard Oak all took part in helping these two neglect cases. It was a joyful journey of love for both humans and horses. It took us over a month to be able to touch their legs without them kicking out in fear. We finally were able to wash off the layers of embedded mud and matted hair and treat the horrible open wound scratches covering their legs. Our farrier took extra special kind and gentle measures to carefully make each hoof trimming experience as stress free as possible. Our wonderful equine dentist donated their first professional dental services. Over the next year the horses received medical treatments, feed, vaccinations, and worming, and a careful exercise and training program to bring them to the peak of health. All the volunteers involved in this process helped these two horses become more confident and their personalities finally began to shine through. Eventually we could start balancing small play sessions into work sessions and they began their training apart from each other in the round pen. They grew more confident and became more independent. They were now more curious than cautious and bonded with their human handlers. They were happy and wanted to please us more and more, just like the wonderful personality traits Gypsies are well-known for! It was during this time that we started to discuss placement for the horses. We had intended to move the horses along to qualified owners at some point. Silvie found her home at Vineyard Oak, and it just turns out that the client at the barn that had co-assisted with the rescue announced she wanted to give Blazen his forever home! We felt this was a perfect match for both horses as we knew they would continue to receive the care, love, and understanding they so needed after such a rough start in life. Along with his under saddle progression, Blazen is a purposeful part of our therapeutic outreach programs. He is a horse who has been through a tough start. He fully understands fear and neglect and has over come obstacles to become trusting, loving and kind. Many of our visitors can identify with these issues and Blazen's story resonates with many of those he meets. We are so honored that Blazen can help others on their journey in his special way.